This page is dedicated for offering services only not requesting. Boots/Gloves: 5ex. Time needed: 1 day. I did hit 500 keys challenge the 1st two weeks. 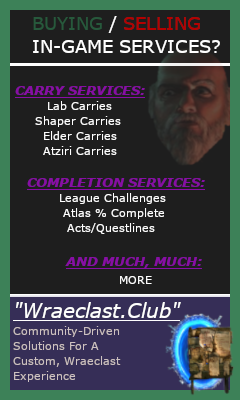 I provide streaming if you want/need, plus i whisper you and link every enchant what i get. You must provide offerings, twice prophecy, (i can do it without the prophecy and look for extra font use from darkshrines but it takes more minutes per run), and the item. When i got the enchant desired, you pay me that’s all. I’ll need 5ex upfront if you want to enchant a helm (no upfront payment required if you want to enchant gloves or boots), i have to do this cuz it can takes 3 or 4 days and you can change your mind and say “dude, i don’t want the enchant anymore”. I can provide some collateral for your item. Will be on most of the day. PATHFINDERS ARE IN. JUGS ARE OUT! IGN: PFLabExileFarmer. Your offering my loot. IGN: PFLabExileFarmer. Your offering my loot. Over 100 carries since start of league! hi i want u to carry me, how much? Price: Your offerings, 3c and my loot. Do PM me in game! Can do any lab carry, not exclusively uber. Discounted prices for multiple runs. Price is negotiable. Preferably your offerings. Fee: (3c+offering) or (2 offering) – my loot in both cases. fast and easy service, a+! Server: Anywhere US, Can probably do EU also. Super fast run. Great carry. Price 3c+offering or 2 offering + loot. I can do enchant service, gloves or boots. W/me for more info. too variable to tell when i’ll be online, but usually always.